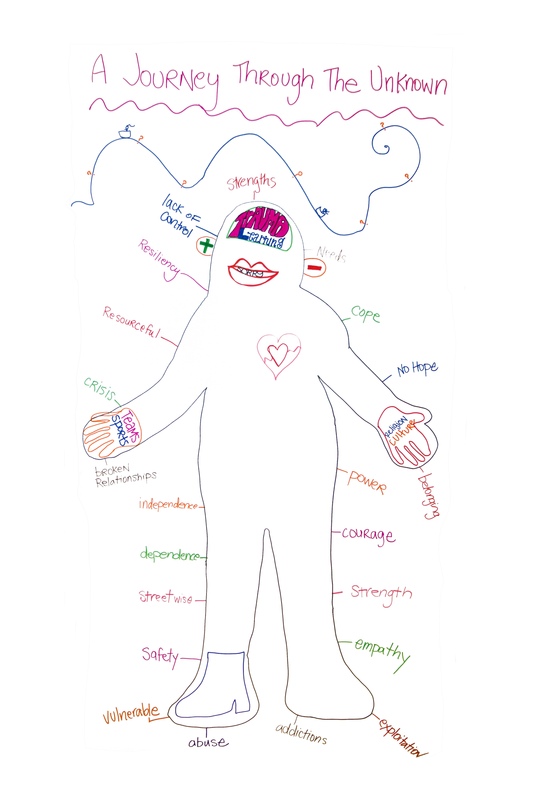 Here is a Body Map of youth in or leaving care prepared by participants (service providers) during a training day by the Ontario Mentoring Coalition. 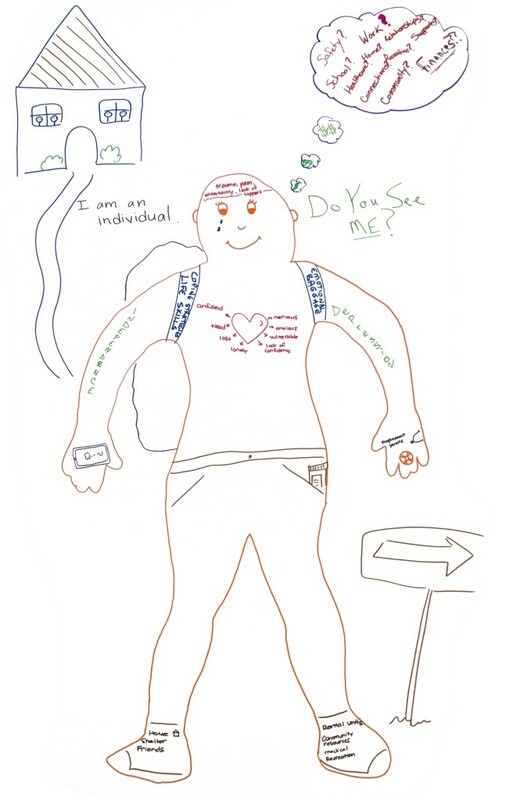 Another Body Map of youth in or leaving care prepared by participants (service providers) during a training day by the Ontario Mentoring Coalition. Many mentoring programs are designed to support youth aging out of care. In the Office of the Child and Youth Advocate of Alberta’s Special Report on youth aging out of care (2013), a key concern was the youth’s desire to be connected to people who would support them when they were no longer in care. They wanted to be involved with people who knew them, cared about them and would be able to develop meaningful and lasting relationships with them… Youth described their desire for connections to trusting adults who they could go to for advice and support as they transitioned to adulthood. Foster parents reported that when their foster children had mentors, the children displayed improved social skills and trust. Mentoring can help youth in care build connections with adults to help them transition into post-secondary education and employment. Youth in care who participated in a one-on-one mentoring program were found to have a statistically significant reduction in symptoms of mental health issues, including depression, anxiety, and trauma. Participating in a mentoring program has been found to help youth in foster care cope with the stressors associated with the non-traditional living experience. Youth in care who participated in a mentoring program were found to have more stable living situations; they did not change foster homes as frequently and were more likely to be reunified with their family than the control group. By providing access to caring and supportive adults, mentoring programs can help youth in care develop resiliency to cope with difficult situations. Mentees in care noted positive outcomes of mentoring included: building strong relationships with their mentors, feelings that life had improved, and gaining life skills for when leaving care. Programs should develop a process for accepting referrals from case workers, foster parents, guardians and the youth themselves. Mentors need to be committed from the beginning if they are going to become a long-term mentor. They must demonstrate a stable lifestyle so that they can be supportive to their mentee. Mentors should receive an orientation to Child and Family Services policies in their province and how the mentoring agency works in relation to this system.22 Information should also be provided on the provincial act governing child and family services and common terms and language related to foster care and adoption. Mentors should be educated on the warning signs of abuse and neglect, and be aware of their duty of care and the appropriate procedures should they notice these signs.22, 29 Mentors should learn about disclosure and discovery and understand how to respond to information shared by their mentees. Mentors should be trained on the agency and community supports available to matches. Mentors should be aware of these resources and how to access them. Emotional support – having someone to talk to during difficult times. Informational support – helping individual mentees understand important life stages (e.g., in regards to post-secondary education). Appraisal support – providing a different opinion when facing adversity. As youth in care may move placements during the mentoring relationship, additional time should be allotted to meet new caregivers in the mentee’s life and provide an orientation to the mentoring program. Care systems vary in their ability and willingness to collaborate with external agencies. There is a need to educate everyone involved in the life of the youth in care (ex. Caseworker, youth worker, foster parent) about mentoring and the role of the mentor. Reduce mental health challenges, including, lowered stress, fewer symptoms of depression, and lower likelihood of being arrested. Reduce suicidal thoughts, sexually transmitted infections, and decrease likelihood to have been in a fight that resulted in injury. Youth who had aged out of foster care who had a close relationship with an adult were more likely to have obtained employment and less likely to have recent experiences with homelessness. Real Connections – Foster Forward Program employs a youth initiated mentoring approach for youth in care. In 2014, the Children and Youth in Care Mentoring Project received funding from Alberta Human Services to increase the number of children and youth in care with access to a mentor. Three established mentoring organizations, Big Brothers Big Sisters of Calgary and Area, Red Deer Youth and Volunteer Centre Foundation, and Boys & Girls Clubs Big Brothers Big Sisters of Edmonton and Area Society, participated in the project. The purpose of the project is to foster meaningful relationships between mentors and vulnerable youth. As of November 2015, there were 139 children and youth in care matched in mentoring relationships as part of this initiative. The Alberta Centre for Child, Family and Community Research prepared a literature review on mentoring youth in care in a Canadian context. Literature on programs that focus on mentoring youth in care were sought out, as opposed to programs that serve a range of youth including those in care. Initially academic studies of mentoring youth in care were examined. When unavailable for specific topics, grey literature was referenced. As much of the literature on this topic originates from the United States, interviews were conducted with individuals with expertise in mentoring youth in care in the Canadian context. The academic, grey literature and interview responses were then critically reviewed and summarized according to thematic categories. Watch Alberta Primetime’s interview with Lana Tordoff, Marketing and Communications Manager for Boys and Girls Club Big Brothers Big Sisters of Edmonton & Area and Brad Murphy, Youth in Care Mentor on the #8000 Mentors campaign and their experiences with mentoring children and youth in care. Britner, P. A., Randall, K. G., & Ahrens, K. R. (2014). Youth in foster care. In DuBois, D. L., & Karcher, M. J. (Eds. ), Handbook of Youth Mentoring (pp. 341-355). Thousand Oaks, CA: SAGE Publications, Inc.
Bruster, B. E., & Coccoma, P. (2013). Mentoring for educational success: Advancing foster care youth incorporating the core competencies. Journal of Human Behavior in the Social Environment, 23(3), 388-399. Greeson, J. K. P., & Bowen, N. K. (2008). “She holds my hand” The experiences of foster youth with their natural mentors. Children and Youth Services Review, 30(10), 1178-1188. Greeson, J. K. P., Thompson, A. E., Evans-Chase, M., & Ali, S. (2014). Child welfare professionals’ attitudes and beliefs about child welfare-based natural mentoring for older youth in foster care. Journal of Social Service Research, 41(1), 1-20. Greeson, J. K. P., Usher, L., & Grinstein-Weiss, M. (2010). One adult who is crazy about you: Can natural mentoring relationships increase assets among young adults with and without foster care experience? Children and Youth Services Review, 32(4), 565-577. Munson, M. R., & McMillen, J. C. (2009). Natural mentoring and psychosocial outcomes among older youth transitioning from foster care. Children and Youth Services Review, 31(1), 104-111. Osterling, K. L., Hines, A. M. (2006). 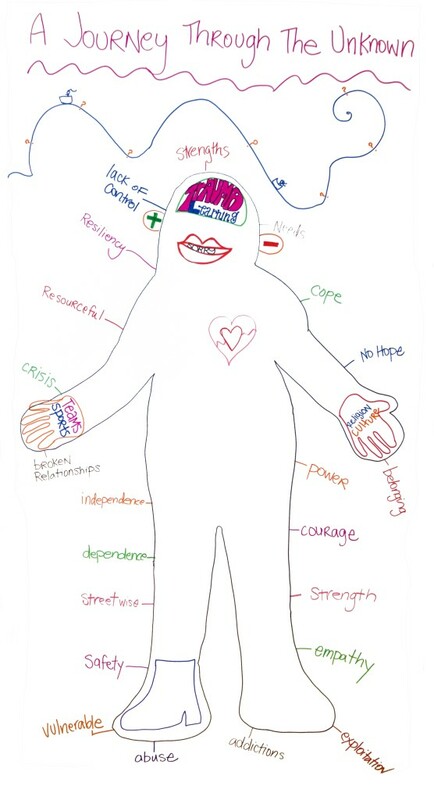 Mentoring adolescent foster youth: Promoting resilience during developmental transitions. Child & Family Social Work, 11(3), 242-253. Scannapieco, M., & Painter, K. R. (2013). Barriers to implementing a mentoring program for youth in foster care: Implications for practice and policy innovation. Child and Adolescent Social Work Journal, 31(2), 163-180. Taussig, H. N., & Culhane, S. E. (2010). Impact of mentoring and skills group program on mental health outcomes for maltreated children in foster care. Archives of Pediatrics and Adolescent Medicine, 164(8), 739-746. Ahrens, K.R., DuBois, D.L., Garrison, M., Spencer, R., Richardson, L.P. & Lozano, P. (2011). Qualitative exploration of relationships with important non-parental adults in the lives of youth in foster care. Children and Youth Services Review, 33, 1012-1023. AndersonDraper Consulting. (October 2015). 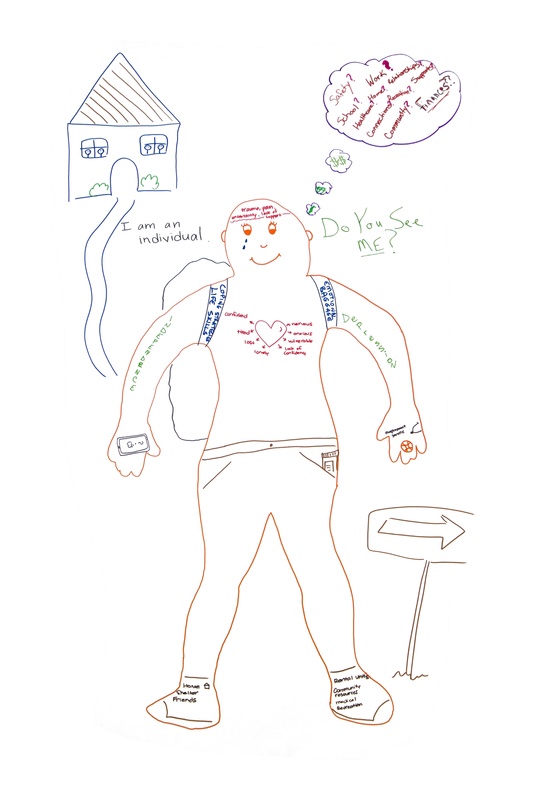 Children and youth in care and mentoring pilot: Year 1 Evaluation Summary Report. AndersonDraper Consulting. (February 2016). Children and youth in care and mentoring survey report. Britner, P.A., Randall, K.G. & Ahrens, K.R. (2013). Youth in Foster Care. In D.L. DuBois & M.J. Karcher (Eds. ), Handbook of Youth Mentoring (2 ed., pp. 341-354). Thousand Oaks, California: Sage Publications, Inc.
Grossman, J.B. & Rhodes, J.E. (2002). The test of time: Predictors and effects of duration in youth mentoring relationships. American Journal of Community Psychology, 30, 199- and White adolescents: Culture, social class, and family networks. American Journal of Community Psychology, 30, 289-303. Hudson, A.L. (2013). Career mentoring needs of youths in foster care: Voices for change. Journal of Child and Adolescent Psychiatric Nursing, 26, 131-137. Office of the Child and Youth Advocate of Alberta. (April 2013). Youth aging out of care: Special report. Spencer, R. (2007). It’s not what I expected: A qualitative study of youth mentoring relationship failures. Journal of Adolescent Research, 22, 331-354. Spencer, R., Collins, M.E., Ward, R. & Smashnaya, S. (2010). Mentoring for young people leaving foster care: Promise and potential pitfalls. Social Work, 55, 225-234. Wilson, J. (2010). Kinnections Mentoring Program for Youth: Program Policy And Procedures Template For Engaging Youth In Mentorship. Vancouver, British Columbia: Ministry of Children and Family Development, Government of British Columbia.